November 30, 2018, 6 p.m. – 8 p.m.
November 30 – December 1, 2018, 6 p.m. – 9 p.m. This quintessential mountain town puts on a stroll reminiscent of the 1840s. The festivities start Friday evening with a Community Lantern Walk down Broadway Street. The Blade Parade follows with snow plows decorated more ways than you can imagine. The fun continues throughout Saturday with wagon rides, sleigh rides, yummy food and, of course, Santa! This year’s annual production of The Nutcracker brings fresh choreography and exciting new theatrical elements. Montana Ballet Company brings together local and national dancers, musicians and designers; trust us, this is an artistic collaboration at its finest. Thursday, December 6, 2018, 4 p.m. – 8 p.m. 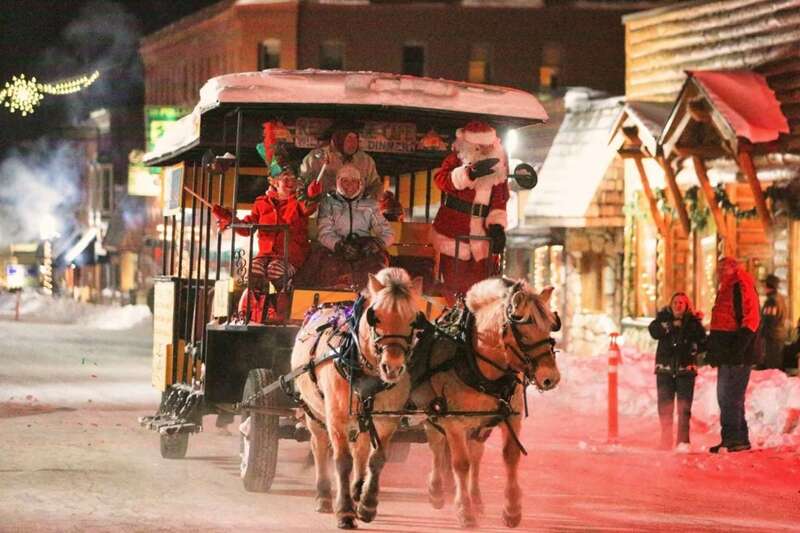 Consider spending a weekend in Yellowstone National Park and kick it off with the Gardiner Christmas Stroll! Located at the North entrance of the park, the town comes alive with a craft fair, live music, food, libations, Santa, and a slew of children’s activities. This little town knows how to pack in some big holiday fun. The day starts with open houses and a chance to win $500 to area business. Round out the fun with hay rides, Santa pictures, a spaghetti dinner, lighted parade, fireworks and Christmas Karaoke. Bring your dancing shoes! Friday, December 7, 2018, 4 p.m. – 8 p.m.
Saturday, December 8, 2018, 8 a.m. – 8 p.m. The town of Belgrade shows up in full force for a day of holiday celebration. Enjoy a live nativity, caroling, and the Holiday Battle of the Bands. A carnival, complete with bounce houses, crafts and activities entertains the kiddos while a craft fair makes it a one-stop holiday shop. Check out the culinary and gingerbread house contests. Food trucks and fireworks round out the evening. Saturday, December 8, 2018, 3 p.m. – 6 p.m.
Tour three of Big Sky’s beautiful homes for architectural inspiration and ideas for holiday décor. Enjoy drinks and hors d’oeuvres at each stop. The tour ends with a holiday bizarre showcasing the work of local artists and vendors. Transportation is available on a first-come, first-served basis. Friday, December 14, 2018, 7 p.m.
“Rocking Around the Christmas Tree” is the theme of this year’s Parade of Lights. (We’re already intrigued!) Don’t miss the chili feed, late night shopping and the joy of celebrating the season with friends and family. This award-winning program is a favorite year after year. Get the kiddos excited about winter activities with a weekend of snowshoeing, ice skating, sledding and cross country skiing. Once they’re worn out, warm them up with some hot cocoa and s’mores! To keep abreast of all the events in Yellowstone Country, go to visityellowstonecountry.com/events.